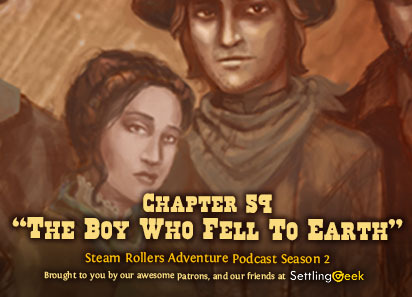 Ep.122 Ch.59 "The Boy Who Fell To Earth"
Ep121 Ch58 "Stand and Deliver!" Nigel is still out snooping around Peace while Percy and Connie continue to get their bearings in Emmett Braxton's saloon in Peace. 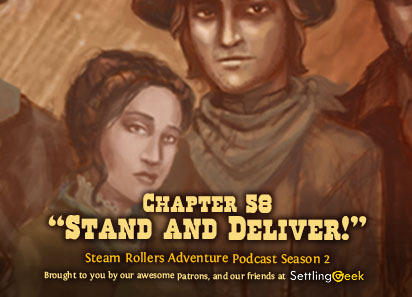 They party splits again as Percy sets off after what appears to be a female Boxcar Boy, and Connie is confronted by one of the legendary murderous Highwaymen of the Confederacy. 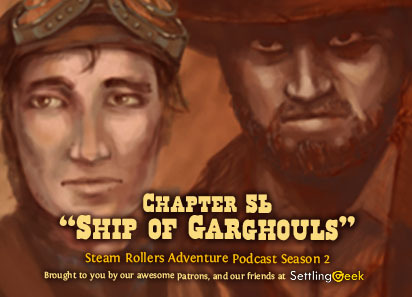 Ep.120 Ch.57 "Kingsley and Bounton"
Ep.119 Ch.56 "Ship of Garghouls"
In this week's episode, Oliver and Silas find themselves fighting for their lives as the luxury airship Maria is crawling with witch surrogans in the form of horrific garghouls! As Silas searches for the missing children, Shiloh and Pinny, Oliver makes his way aft from the bridge to see who's still alive.